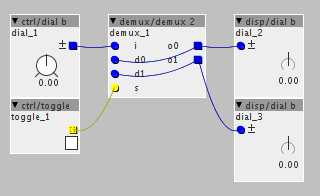 I use a demux to route the signal and the signal is sent back to the default params. So, this works but with a limitation, when I switch the output, the new one gets the value of the previous. I need to avoid this behaviour. The best solution will be to keep the value on the new one until the dial reach it but also change the value only when I move the dial could be ok.
That should work. IIRC I used the same method in my Modular Thing Add On Board Patch. I did a quick look at it but it is quite complex! can you please have time to break it in a smaller patch only to show the concept? I will very appreciate this! It really is not that complex, its basically the same small system for a pot copied many times. But I can make a simpler version today or tomorrow. But yeah if it really is for a pot input, I would suggest trying what @MattilynMattroe says. That is probably the best way to do it overall. But you will find that if you use a lot of those, your patch will get heavy on the SRAM use, so it's probably better to use an object like TSG/ctrl/multipot 3. Generally, what you're trying to do is called a "hook" around here, so if you search this forum for "hook", you'll get a lot of options. Right now I've decided to use the TSG/ctrl/multipot 3. I agree, I think it's better to create a specific object with this, which takes a dial and a switch as inputs, and outputs two values, where one is constant and the other one changes depending on the position of the switch. The actual code to implement this should be fairly trivial.